What does it take to compete on the international stage in sport? 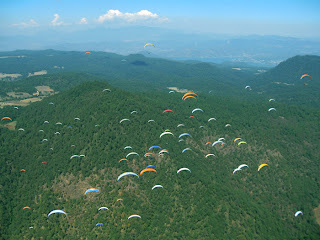 Today a pilot died while competing at the Paragliding World Championships in Valle de Bravo Mexico. This is a very sad event and an indication of what each pilot who competes at this level of paragliding competition must keep in the back of his/her mind. While I like to tell my friends that XC paragliding is the activity I derive the most enjoyment and reward from, I understand the risks. My risk/reward assessment allows me to continue to fly with confidence and enthusiasm. I do have control of some of the factors: My currency, my familiarity with the area, wing characteristics & safety, the forecast weather. Those risks that I can't control, I minimize or avoid. But many risks are not visible or creep up stealthily. "To put it bluntly, top competition pilots in general and particularly competition paraglider pilots are just not normal. Does anybody think that leaping from a hill into angry conditions with your safety assured by 7 kilos of marginally stable sail cloth which at any moment could decide to stop flying, is normal? Let’s face it, most Olympic Athletes or indeed most competitive sports people do not run a very significant risk of death or serious injury each time they participate in their chosen sport. The only things that spring to mind are some forms of motor sport and a few ‘extreme’ sports. In spite of recent advances in equipment and organisation I rarely do a competition where somebody doesn’t ’smack in’, often with quite serious consequences. The fact that we, as pilots, accept this means we are not in any way a ‘normal’ cross section of the population at large. In fact we are pretty weird as far as I can see. So the point I’m making is that the very top guys in a sport where the risk of death or disablement are so high are unlikely to conform to social norms. If they’ve survived the day, they’re likely to drink, smoke or engage in other frowned upon behaviours. If they were unable to control these behaviours and were flying whilst unfit then Darwinian Forces would have removed them from the gene pool long before they’d amassed the thousands of hours flying necessary to be chosen for a National Team and compete in the World Championships." Mark, in my opinion, does a reasonable job of describing the risks of Top-Level Paragliding XC competition. How many seven figure baseball, cricket, football, players risk life & limb to win? If they did risk it all, and for no money - just the thrill of the game, do you think the same guys would be doing it? The group I 'hang' with, competitive XC pilots, risk all they are willing to (and more, that is often out of their control) for little or no money. We fly and compete for the thrill and experience and camaraderie. It's not just a hobby. It is the activity we do that somehow gives perspective to the rest of our lives. So - Today we are one less. A fellow flier has flown his last flight. I hope that the thermals are fat and smooth in the after. I know why he flew and why he accepted the risks. I understand. I don't usually get very excited about sporting events - especially when it comes to yelling "USA" at an international spectacle. The US Paragliding Team is making me sit up on the edge of my seat as they hold there own amongst the best pilots in the world. The World Championships are being held in Valle de Bravo, Mexico this week and next. With 3 tasks complete. California pilot (and fellow BAPA League pilot) Eric Reed has flown consistently well and sits in FIRST Place! Brad Gunnuscio and Farmer and Kari are also flying well. This competition seems to be attracting a lot of world attention and the best coverage can be found at the EAGLE PARAGLIDING BLOG. My favorite individual pilot blogs are those of Mads Syndergaard(DNK) and Mark Hayman(GBR) and Nicole Mclearn(CAN). One of the things that a good comp pilot does is minimize distractions and "get stuff out of the way." During a competition, the stuff of daily living can be a distraction - or worse, if not handled properly, it can affect your performance. Get a bad night's sleep or skip a meal and you will not be at the top of your game. How to provide options to 80-100 pilots in a very small town has been on the mind of Comp. Director Jugdeep Aggarwal. This week I met Jug in Dunlap, CA to do a bit of informal recon and planning for the upcoming U.S. Paragliding Nationals. We made a visit to the St Nicholas Ranch in the Dunlap Valley. The facility is associated with a Greek Orthodox monastery and very well maintained and organized. Jug's goal is to provide the best experience for all pilots. A couple of the issues each pilot needs to deal with during a competition week are those of lodging and food. In the Dunlap area this is a bit of a challenge. The lodging available at the various small motels is, to be generous, 'very rustic.' Those that want to camp can find spots in many places around the valley but there is no WiFi and services are generally a bit gritty. Another concern is the need for transportation and transit times from the campsite to HQ each day. Additionally there are only a few small places to eat in the local area. Clean modern rooms and beds with A/C and heat. A beautiful pastoral setting with hiking and a lake on site. Jug has decided to offer an option for an 'inclusive' plan. I know what you are thinking, THAT WILL BE TOO EXPENSIVE! I'm not trying to sell YOU the plan but I'll tell you why I'm for it - It pencils out. If a clean, comfortable bed is available at a competitive price and the chow hall serves good food across the hall, why sleep on the ground and drive all over the valley to eat cold pancakes? This place is a gem in Dunlap and I can't believe I haven't discovered it until now! It has been decided that The Ranch will be the headquarters for the meet and it was logical to offer an inclusive package that allowed all participants the option to sleep and eat dinners and breakfasts at the ranch. This spot is the perfect place for pilot meetings and briefings as well as social events around the BBQ pit, ping-pong tables, and the pool. I can, without hesitation, endorse this facility as the best spot in Dunlap to base our competition. I will also go out on a limb and say that you will enjoy staying at the Ranch. I'll be staying at the site and eating the home cooked meals in the dining room. Why? Because I know the quality is there and because it will "get stuff out of my way" at a very comparable cost to the sub-standard alternatives. For those of you concerned with the Ranch's association with the Church, I understand where you are coming from - I was there and asked, "what are the rules?" Is smoking allowed? YUP (outside) How 'bout alcohol? No Problemo. The only restrictions the site has is (smirk) NO FIREARMS. Oh, and no dogs. If you want to have an enjoyable first comp of the 2009 season, come to Dunlap and see what I'm talking about.